This should have taken a lot less time than it did. 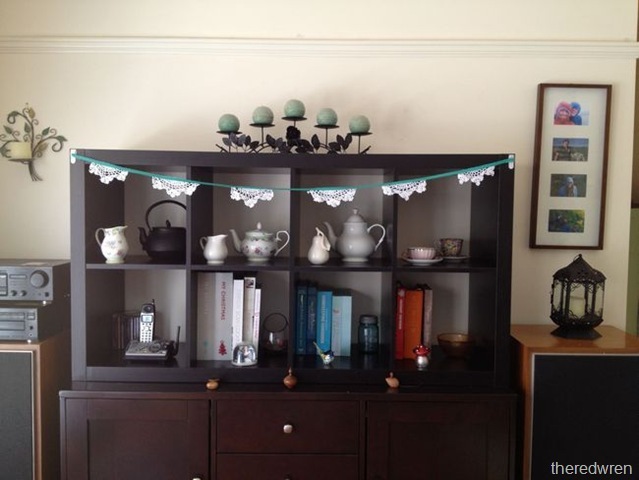 I cut my doilies badly, I used to thin bias tape, I didn’t use the walking foot… but we got there in the end and I now have a cute string of doilies to hang over the shelf. The back room is slowly being redecorated. Before Christmas I replaced the wooden venetians over the French doors with net curtain. The change means no more venetians banging against the door every time we open it and the room is much lighter. The bookcase on the buffet is a recent addition. We bought a couple from Jen last week and weren’t really sure where we planned to put the 4×2. Yesterday I had a brain wave to put it on the buffet so we’d have somewhere to put the recipe books. It’s really helped to balance the room as the stereo has always looked a bit odd towering over the buffet in the corner. The wall canvas which was on the wall is now on the other wall which I’ll unveil once my new cushions are complete. the 2×4 looks great there! 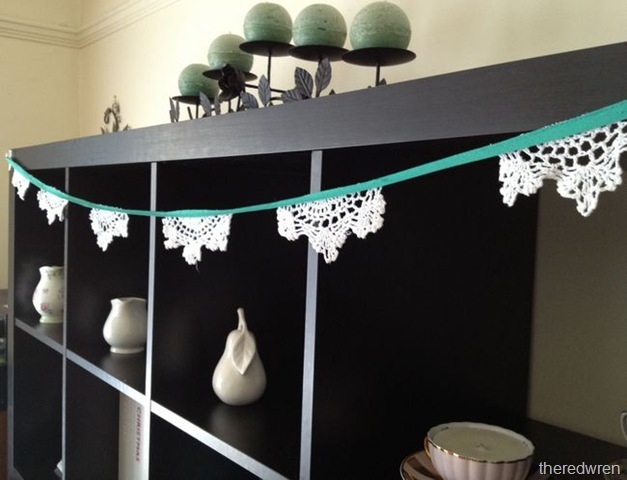 and the garland is gorgeous! Thank you! I’m rather pleased to have the extra storage space.